Personally, I believe all leaders should aspire to achievement of their Wood Badge, as it provides a level of personal acheivement and fulfilment as well as the formal aspects. A leader who has achieved this award can be recognised as they also wear a set of wood beads that they are presented. A leader with more than two beads has made the effort to complete the wood badge in more than one section of scouting. In order to gain a wood badge, a leader has to complete 3 Advanced Leadership training weekends (known as the AL1, AL2 and AL3). The Al1 is general, and all leaders do the same course, but after that the other weekends are section specific. There have also been some training courses held at Easter that cover the AL2 & AL3 over the 4 days. In addition to their "Wood Badge", a leader will attain 1 or 2 "Certificate 4" qualifications. 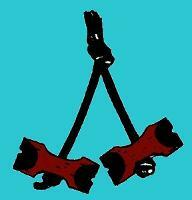 One of the requirements for attaining the Wood Badge is completion of the Project. The Wood badge Project needs to be something that has taken a minimum of 10 hours effort, (this site has taken hundreds so far) and the purpose of this page is to assist people by listing a few of the things that others have done for their projects to get your ideas flowing. I would love to place a summary of as many leader's Wood badges as possible, for all levels of Scouting, on this page, so that other leaders can be inspired, and we can all help each other in the spirit of Scouting. Please email details to i2 @ robian.net (without the spaces of course). If your wood badge project is available online, please also include a link, or if it is in a file format, and you cannot manage to make it available online, but would like others to be able to access it, depending on the file size(s), I may be able to add the file directly on my site if you like. Jacala's project - Create and run a stall at a local fair to interest Joey-age children and their parents as a way to attract more members into the Joey Section. Fe (Karakara) AJSL at 1st Pelican Point Sea (Joey) Scouts assembled a collection of ideas for Joey Scout Mobs in Sea Scout Groups, to emphasise the ‘Sea Scout’ side of things—so their experience is not identical with that of Land Scout Mobs. It can be found in digital format at alittlebluebookblog.wordpress.com. My own project was a guide to the Boomerang Scheme so that I could hand a folder to a parent helper or a new leader, and they would be able to feel comfortable covering almost any section of the Boomerang tests for any of the three levels. I then realised it would be difficult to pass this to enough leaders, and it became this website - and has expanded a lot in the process. I have maintained the pdf version as well, because I still use in the way that I had planned to do. A copy of the 3 pdf's are available via the Boomerang Page (use above link). A previous leader at 1st Picnic Point who had great artisitic skills redecorated the interior walls of the hall in a jungle-book theme. Bernd Gillhoff, (a former Akela of 1st Mount Waverley) wrote a short version of Rudyard Kipling's Stories in the Jungle Book in modern English. "His work has a strong emphasis on the Law and Promise and how the Laws of the Seeonee Pack helped the wolves to live and hunt successfully, as well as the demise of the Pack when these Laws of the Jungle were disregarded". A previous Cub Leader in our pack designed and painted the walls of our hall in a Jungle Book Theme. (I will add some pics when I get the chance). I recently saw part of a project that details science experiments to cover the Scientist badges and other bits. I will be using some soon, and adding details on Cubstuff when I have more of it. These ideas were on a list of suggestions given to us on a training course. Some indicate a particular section while others are general, however sometimes the best ideas come from adapting another sections idea. Develop & implement ideas for Scouts Own suitable to your sections age group. Develop a Jungle Book file including games and activities and produce two programs using reference back to the Promise & Law using that file. Develop teaching aids, stories, programs to include knotting and produce two programs incorporating your ideas. Develop & introduce two programs based on Conservation and the Environment into the Pack Program and Award Scheme using games, instruction, activites, yarns etc. Develop a series of training aids on Aboriginal Culture for inclusion in the Cub Scout Program. Develop self expression ideas for your section through campfires and sing-songs. Develop a Campfire Resource Book including sections on firelighting, Scouts own, Songs, Prayers, Yarns. Develop Develop a complete training package on the Scout Leadership Course and present it as a package to Region Mindari. Develop training aids to introduce Duty to my God, Self and Others into three Joey Scout Programs. Introduce a knowledge and appreciation of Baden Powell into two programs including resources/training aids needed. Reintroduce the World Conservation Badge to the section in the form of training aids and activites for two programs. © 2009 Ian Moggs, all rights reserved. However - rights are given for copying and printing for personal use or use in cub-scout or similar groups. Last updated 29th October 2016. Email me anytime - i2 @ robian .net (without the spaces).